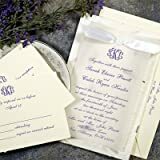 Gartner 50-Count Hand Made Paper Wedding Invitation Kit: This is a gorgeous wedding invitation kit from Gartner Studios. The kit features stunning, hand-made paper invitations, plus coordinating envelopes, vellum, ribbons and response cards. Each box contains enough for 50 complete invitations. Simple-to-follow directions let you custom-photograph your own invitations in a snap.